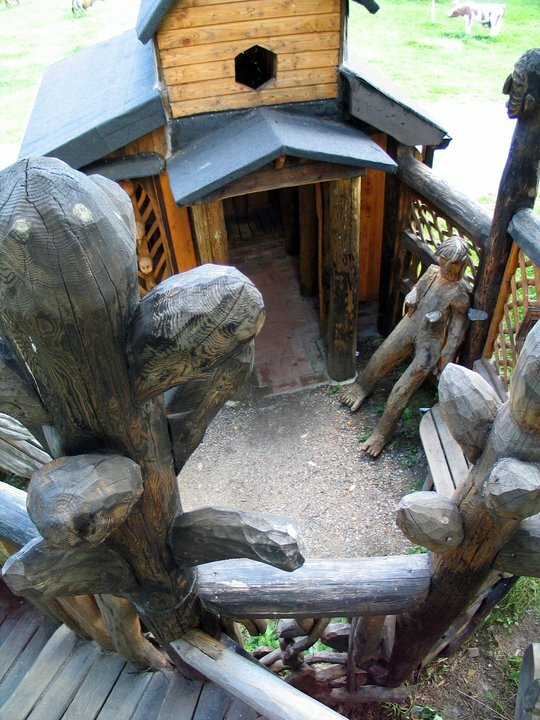 Above wooden structure, realized in 1986 by Ben Wilson (b. 1963) in the woods near the community of New Barnet, north of London, doesn't exist anymore. Ben Wilson was born in Cambridge. The family moved to New Barnet. It was an artistic family, and young Wilson probably felt attracted to making art. However he was not very much inspired by formal art courses. Instead of following the lessons at the Middlesex Polytechnic, he would rather wander in the woods. 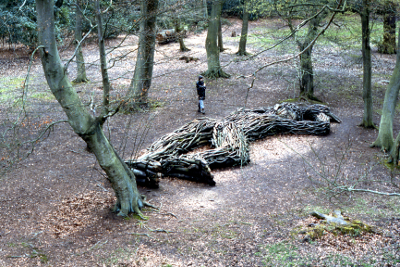 So he followed his own direction, going out in the nature and making big sculptures from materials which are freely available in the woods. 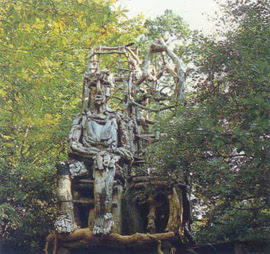 He made all kinds of big wooden personalities, chapel like structures, and so on. In the 1980's, 1990's and the early years of the twentieth century Ben Wilson focused upon making wooden creations, often large constructions realized on the spot in the open air. However, he also made smaller creations by carving and painting found wooden materials. 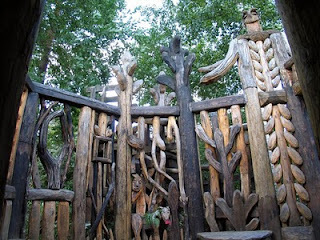 In 2003 Wilson made a trip to Finland, where he created a wooden structure for the Kaustinen Folk Art Museum. From 2003-2004, working in a local London coffee shop, he made a series of black and white paintings. 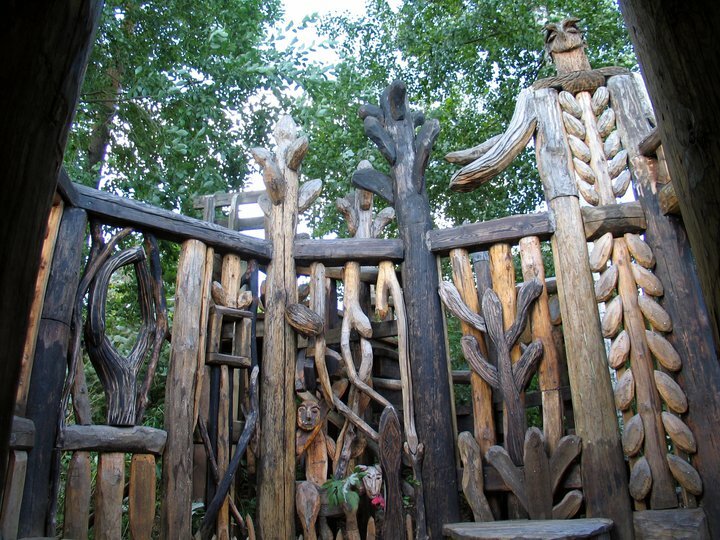 His creative activity, mainly his work with wooden structures, earned him some fame in the circle of outsider art enthusiasts in the United Kingdom. So he was one of the artists selected to participate in the British Outsider Art exposition in the Halle Saint Pierre in Paris (2008). By that time, however, Ben Wilson had been looking for other ways of artistic expression. He tried graffiti by decorating public bill boards, but this would give him a lot of problems with the police. 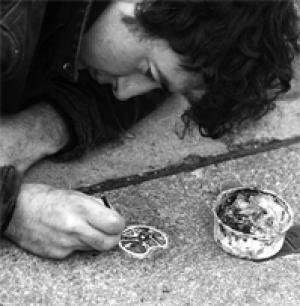 In 2004 he began decorating small pieces of chewing gum that were dropped on the street. Because he worked on location, lying on the street, he attracted a lot of attention from passersby and got publicity from a point of view of "human interest", but it did not put him in trouble with the police. This he has been doing since, creating some 10.000 small decorations on the pavement, starting in New Barnet and then heading towards central London. A november 2010 BBC video shows him at work in the streets. Making these small pieces of visual art can be seen as a very special variety of street art. Anyhow, Ben Wilson is creatively redefining his place of living (and reading the interview on Christina's blog, one can notice that by doing this he gets into close contact with people around, policemen, residents, youngsters, shopkeepers....). Like other creations in the realm of outsider environments, these decorated chewing gums might not withstand the test of time, what also happened to the wooden structures in the woods, which already have disappeared. Ben Wilson and I installed one of his large sculptures Upstairs at The Nellie Dean of Soho in Dean Street London, this afternoon... a temporary installation, the giant wooden figure is currently propping up the bar. Tomorrow I am hanging an exhibition there to showcase Ben's beautiful pastel drawings which he worked on between 1999 and 2001. There are many connections between the wooden works and these pastel pieces. Do come along and see the show if you are able: 20 September to 20 November, 2011.